Their legs are grey, their ears are nulled, their eyes are old and bent. IT’S. 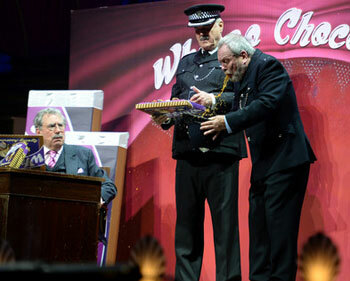 Monty Python’s Flying Circus 2014. Oh, and one of them’s been dead for over 25 years like a very naughty boy. In 1998, the five remaining members of Monty Python (John Cleese, Terry Gilliam, Eric Idle, Terry Jones and Michael Palin) convened in Aspen for a tribute by the U.S. Comedy Arts Festival. At that gathering (their last group appearance being 1982’s LIVE AT THE HOLLYWOOD BOWL; their last group film, 1983’s THE MEANING OF LIFE), when asked if they were going to “do something together again,” they made the “historical announcement” that they were! So in July 2014, 16 years after making that promise (!) Monty Python at last align their stars and schedules to come together onstage for Monty Python Live (Mostly): One Down, Five to Go, a one-off live show at O2. It sold out in 43 seconds. In the end, 10 shows were performed. But it was never about fun and games and keeping promises. Presenter Alan Yentob asks Eric Idle, “Why are you doing it?” We expect Eric to blurt, “The money.” That reliable go-to gag for people who obviously don’t need the money. And Eric actually blurts out, “The money”! Seriously. He outlines how they had to legally defend themselves from a producer on MONTY PYTHON AND THE HOLY GRAIL who sued them, costing them a million pounds. Eric quipped to Jim Beach (manager of Queen, brought in for legal advice), “If we did a night at O2, we could pay this off in a second!” At the collective Python meeting the next day, Beach said the same thing. What a good idea, said Eric. Eric Idle is painted as the one Python holding the mammoth production together, the producer if you will, organizing music, dancers, rehearsals, production design and finding the albatross; delegating, stipulating and fulminating, while the rest don’t really know where lieth those little things with the sort of raffia work base that has an attachment. Every time a classic Python sketch is mentioned, we see that sketch from the original series, not any permutations of it. It is a thing of beauty that it is. It’s not so much that their hair is gray, their teeth are false, their bowels are unreliable… Their conviction is lacking. Gone is the impeccable timing and energy of their youth, with each sketch being performed with a nudge nudge wink wink to the audience that everyone knows what’s coming next, so it doesn’t matter if it feels staged, if they forget lines or break out of character and corpse. 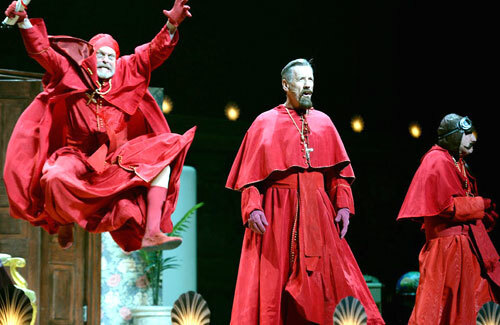 And everybody expects The Spanish Inquisition… More than anything, it seems like “five slightly shriveled septuagenarians” (as the humorless Daily Mail put it) trying to fulfill a manifest, dutifully putting all the pieces where they belong. In 2000, Eric did a tour called Eric Idle Exploits Monty Python. 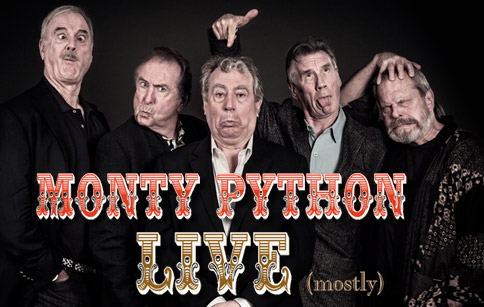 With Eric’s financial explanation about this tour, and with all the members not wanting to, or not having the time to, rehearse, and with the brand recognition they all enjoy when coming together (which only aids their individual pursuits), then surely it is now a case of Monty Python Exploits Monty Python. But then, isn’t that what we ALL do? Cherrypick our inimitable, explosive art from our youth and spend the rest of our wretched, diminishing lives trying to recreate it. Robert De Niro Exploits his Gangster Persona; Gene Simmons and Paul Stanley Exploit KISS; Pete Townshend Exploits The Who. But all the naiveté and nostalgia and sociological swirl of the times that were an integral part of creating that original art are in a different balance now. So one NEVER recaptures the EMOTION that was an integral part of that art, therefore any attempt at recapturing art FULLY will necessarily fail. I am saddened that that is the Truth – not in any capitalistic or cynical way – just in the sense that we all get older and snider. And nothing can retain the innocence and humor of youth. Sad sad sad. The reasons keep changing but I’m still weeping rivers. But – as Cleese says – Python “made some people laugh.” And that is the bottom line. They did it. In such a giant way that it can never be undone. “Pythonesque” is not only in the Oxford English Dictionary – it’s in every English dictionary. They are part of history. They shine out like a shaft of gold when all around is black. Like a stream of bat’s piss. Speaking of never being able to recapture art: Superman was in a wheelchair, Freddie Mercury died, Paul Stanley lost his voice, Clint Eastwood swerved rightwing nutjob, John Cleese can’t Silly Walk— Due to extensive knee surgeries, Cleese’s most iconic performance piece is nixed forever. And you ask why I’m still weeping rivers of British Columbia. Worse, the choreographer is putting the sketch to music and a host of young dancers play the ersatz Minister of Silly Walks. And that’s a biggus dickus bowl of wrong. Carol Cleveland (the “seventh Python”) makes the show – aged like a fine wine (kept in a cellar for thirty years). Neil Innes (the other seventh Python), unfortunately does not. And Graham Chapman (not the Messiah, just a very naughty boy) appears in videos, his spirit living on in Python media and shows, so long after his death that he might just BE the Messiah…. Documentary ends on the five Pythons, gathered before the tempest, just about to hit the stage before their first show. Cut to black. Starring: Alan Yentob, Graham Chapman, John Cleese, Terry Gilliam, Eric Idle, Terry Jones, Michael Palin, Kate Beckinsale, Graham Norton, Simon Pegg, Robbie Williams. Drummer Bear (Mike Fass), Zangief from the hit series, "Street Fighter: The Later Years"
SOOOOOO good to see Poffy risen from the accidentally tossed vegetable pile! Fitting that our favorite veggie critic be the one to best cover “…Something Rather Similar”. I grew up with these guys and Python was an immense inspiration to our 1970s comedy team, The Happydale Inmates” (1975-77). We never even approached equaling them but they sure did show us what was possible. Because of them, my love of black humor became fused with my until-then-unacknowledged love of absurdist comedy. I’ve always believed that, if you can’t recreate the spirit and energy of your past, go in the other direction and continue to evolve toward your future. The Beatles did this in the mid-1990s when they reunited to create new music. I was ecstatic but I remember a few preservationists being curiously upset that The Fabs were “messing with their legacy”. Some said, “It can never be the same again”, to which I countered, “Can you name ANY time during The Beatles’ initial career throughout the 1960s when it was EVER the same again?”. That’s because they always grew. They always evolved. So the very notion of a geriatric comedy team trying desperately, and with questionable sucess, to reclaim their former sparkle is itself fraught with NEW comedy. Our show (“Street Fighter: The Later Years”) certainly proved that and I’m a bit surprised that these men seem not to have considered that. Although our creaky British heroes make innumerable swipes and asides about that very issue, it still renders the concept merely self referential rather than being the engine that truly drives their reunion show. Can’t do the Silly Walk anymore? THERE’S your show! That said, it’s still great to see them having a go at it at least one more time. P.S. The mighty Zangief sends his love and respect to one of his favorite rockers, Mr. Jon Dunmore.